One of the more interesting trends in green building design is the green roof. 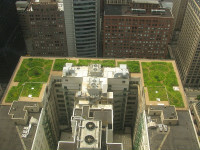 Green roofs can be as simple as a series of planter beds or as complicated as a whole plot of grass. But either way the evironmental and economnical benefits are numerous: less energy to cool the building, less stormwater which pollutes the oceans and rivers, less carbon dioxide, and greater sustainability especially if edibles are grown. The only problem with green roofs is that they consume both water and energy because of the pumping required to bring water to the roof. Rainwater harvesting is great in that situation because the rain is delivered free right to where it can be used with no pumping. And RainSaucers can make that happen because unlike your typical RWH setup, we don't need to connect to a downspout at the bottom of the building. We can deploy anywhere on the rooftop itself right next to where the irrigation is required.